Alexey Rychkov (was born in 1968) graduated from St.-Petersburg Academy of Art and design (1993). At first time of his studies, Alexey already starts to cooperate with art galleries of Finland, Poland and Prague. In 1995 he was invited to Paris, where during four and a half years he created over 100 works, which were successfully sold by the auctions and on the exhibitions of Russian art in Paris. Several paintings of this period were purchased for interior decoration of Grand-Hotel West Minster (Paris). After obtainment of the recognition and popularity in Paris, Alexey resumes his work in St.-Petersburg. In 1999 7 paintings of the artist were purchased by National Historical museum of Australia (Sydney). Two years later, St.-Petersburg Mining Institute places a prominent order to re-create forfeit portrait gallery of Russian Emperors and noted scientists. At the same time the artist creates several landscapes with a view of St.-Petersburg Mining Museum. In 2002 Diplomatic representatives of the Ministry of Foreign Affairs in St.-Petersburg organized the Exhibition “The Art of Portrait” with Alexey Rychkov’s participation. Later the Ministry of Foreign Affairs purchased the painting of the artist for its solemn presentation to Kofi Annan in the Palace of United Nations Organization. In 2003 Alexey participates in the celebration of the “300 Anniversary of Summer Garden” (St.-Petersburg) organized by Russian Museum, where he wins Grand-Prix. In the same 2003 the artist creates several works dedicated to Russian Ballet. Some part of these paintings was represented on the exhibition «Ballet. Ballet? Ballet!» in the gallery «PAR» (Zurich, Switzerland). 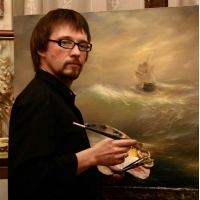 In 2006 Alexey participates in the sea-scapes contest (Ethnographical Museum, St.-Petersburg). Three of his paintings were purchased by the founders of the exhibition (Germany). In 2007 a prominent Russian company “Gazprom” nominates Alexey Rychkov for the Best Artist of the Year and publishes a Calendar of 2008 with his paintings. In 2008 Art-gallery “Liberty” organizes exhibition “Images of Marine element. Marine Artists of 20th century.” with a support of Central Navy museum of Saint-Petersburg. The paintings of Alexey Rychkov, presented on the exhibition, were purchased by foreign galleries. One of the central subjects in the works of Alexey Rychkov is views of Petersburg. In 2009 the exhibition “Channel views” took place in the art-gallery ”Mon-Martre”, where Alexey took an active part. Today Alexey Rychkov’s paintings are presented in museums, private collections and art-galleries of St.-Petersburg, Moscow, Prague, Paris, and also Australia, Germany, Switzerland, USA. Rychkov Alexey, St. Isaac Scuare, 60 x 80 cm, oil on canvas, 2010. 6.200 gr ..
Rychkov Alexey, Walk at St. Nicholas Cathedral, 50 x 60 cm, oil on canvas, 2014. 2150 gr ..